Your extra large bolster pillow is a showstopping style statement, demanding the attention in any room. With four areas to customise, it's a striking home furnishing that instantly brings personality and life to its surroundings. Your large sausage cushion is handmade using luxury Soft Velvet fabric and firm, sumptuous padding. The firm, plump padding and dreamy Soft Velvet cover of your large bolster pillow make it such a luxury furnishing for the home. Designed by you using your photos, patterns or special messages, you can create something to complement your existing decor, or turn it into a gift for newlyweds or recent homeowners. The sheer size these large bolster cushions give them several uses, such as extra back support whilst reading, or a pillow to use during pregnancy. Handmade with a luxurious finish, there's nothing quite like this decorative bolster cushion. Product was perfect, pictures etc perfect and delivery was also very good service! Very quick production and delivery, good quality bolster! Like many of our products, the large bolster pillow comes with a quantity discount, so you can design a set and save money. When you buy two or more, the price per cushion is cheaper, so design a duo or set for the family now and enjoy the saving. Design your own large sausage-shaped cushion and bring personality and vibrancy into the home. All four areas are customised individually, so we print separate pieces of Soft Velvet fabric using a specialist process that creates a full colour, permanent print. Hand cut and sewn to order, our seamstresses expertly stitch your bolster pillow together, resulting in a flawless finish. The plump, feather padding is inserted, and the zip is finished with a heart pendant for an extra touch of sparkle. The printable areas you get to adorn with your fabulous photos are the front, back and two ends. Consider the long, cylindrical shape when choosing your design. As a guide, landscape images or repeat patterns/photo collages work best. The ends can be used for a special message, initials or a complementary block colour. Create a personalised pregnancy bolster. 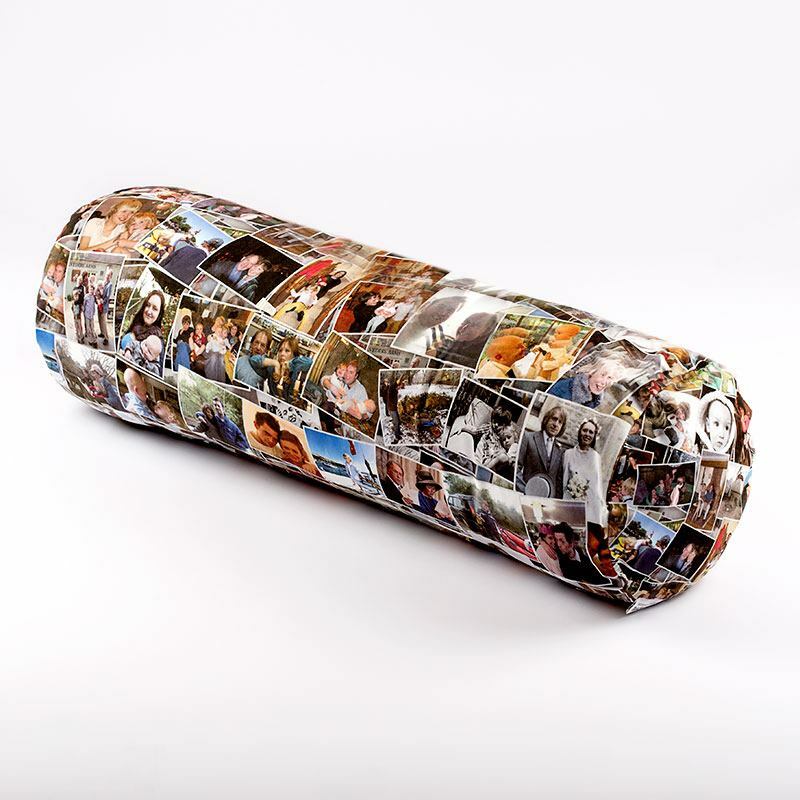 If you or your partner are expecting, this large bolster pillow, printed with your unique pregnancy photos, is a truly special gift. Not only does it have the stability to offer support, but it also doubles up as a sentimental keepsake that can be looked at in years to come with fond memories. Design your own large bolster pillow for reading. Settle down with a book in bed or on the sofa and use your sausage cushion for extra back support. Propped up against your back or used to rest your feet on, it helps you get comfy and inspired, especially when printed with your favourite literature quotes, poems or even song lyrics. Make your own playroom bolster cushion. These firm, plump bolster cushions are large, supportive and resilient, making a perfect addition to a kid's playroom. Used to lean against when reading, it can be associated with downtime and relaxing. Print a fun nursery rhyme or some educational games to combine learning with play.